When I have V-Go on, I truly forget that it’s there. Debbie was diagnosed with Type 2 diabetes in her early 30s. She couldn’t get her blood sugar under control and was frustrated with taking insulin shots in the middle of the day. When her doctor told her about V-Go, she was excited to learn there is a simpler and more convenient way to get her insulin that doesn’t slow her down. And by switching from multiple insulin shots to V-Go, she was able to significantly lower her A1c to 6.9*. With V-Go, Jim can focus on his passion, not his insulin. Wearing V-Go is like wearing a watch. I really don’t know that it’s there until I need to reach for it. Jim has type 2 diabetes, but he won’t let it get in the way of his passion to serve his community. When Jim was taking multiple insulin shots each day, it was difficult for him to inject discreetly or even remember to bring along his pens and needles when visiting those who are home bound. Using V-Go gives him a sense of independence because he doesn’t have to worry since his insulin is always with him. Most importantly, with the help of V-Go, he was able to bring his A1c down to 7.0*. Jim wants to do whatever he can to be healthy, and V-Go is a part of that process. Barbara has had type 2 diabetes for many years. Using V-Go to deliver insulin instead of injections allows her to enjoy her day rather than focus on her diabetes. 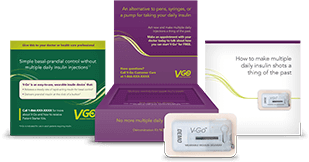 Thousands of people with type 2 diabetes are using V-Go. See what some of them are saying about it in these video clips from the news. Have a FREE Demo sent to you. Want to see V-Go for yourself? Free yourself from having to take several insulin shots every day with the treatment option you apply like a patch. If regular adjustments or modifications to the basal rate of insulin are required in a 24-hour period, or if the amount of insulin used at meals requires adjustments of less than 2-Unit increments, use of the V-Go Wearable Insulin Delivery Device may result in hypoglycemia. The following conditions may occur during insulin therapy with V-Go: hypoglycemia (low blood glucose) or hyperglycemia (high blood glucose). Other adverse reactions associated with V-Go use include skin irritation from the adhesive pad or infections at the infusion site. V-Go should be removed before any magnetic resonance imaging (MRI) testing.